From A14 Eastbound take the turning marked "Quy, Newmarket". Follow signs to Newmarket. You will come to the July Course/Newmarket stallion roundabout with a bronze of a rearing stallion on it. Take the second exit towards Newmarket town centre. After one mile of straight road there is a speed limit 40 sign and a left turn marked "Rowley Mile Racecourse" and "Hospital" - this is Hamilton Road. Go straight down the hill, over a horse crossing and past a right turn. 50 yards after that on the left, after a big chestnut tree is Chestnut Tree Stables. Take the M11, then the A11 to Norwich and Newmarket. Take the A1304 to Newmarket off the A11. You will come to the July Course/Newmarket stallion roundabout with a bronze of a rearing stallion on it. Take the third exit towards Newmarket town centre. After one mile of straight road there is a speed limit 40 sign and a left turn marked "Rowley Mile Racecourse" and "Hospital". This is Hamilton Road. Go straight down the hill, over a horse crossing and past a right turn. 50 yards after that on the left, after a big chestnut tree is Chestnut Tree Stables. Enter Newmarket town centre from Norwich/Bury St Edmunds/Ipswich. Proceed down Newmarket High Street away from the Clock Tower, with Waitrose and the Rutland Arms Hotel on your left. Keep going away from the town centre, signed to Cambridge and London until you see the 40 speed sign. Go past "Heath Garage" on your right and the cemetery on your left. 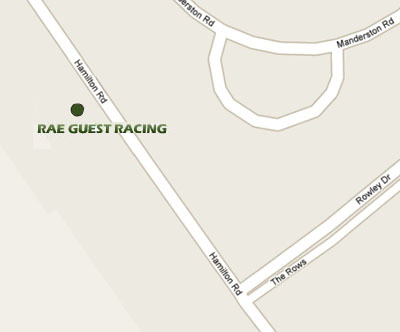 take the next right marked "Rowley Mile Racecourse" and "Hospital" - this is Hamilton Road. Go straight down the hill, over a horse crossing and past a right turn. 50 yards after that on the left, after a big chestnut tree is Chestnut Tree Stables.